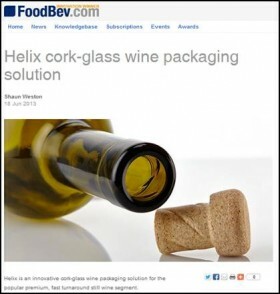 Helix is an innovative cork-glass wine packaging solution for the popular premium, fast turnaround still wine segment. It is now available in Europe courtesy of a four-year partnership between Amorim and O-I. The new 'twist to open' concept combines an ergonomic stopper made from cork and a glass bottle with an internal thread finish in the neck, creating a high performing and sophisticated wine packaging solution. In extensive testing conducted by Amorim and O-I, wine packaged in Helix glass bottles with cork stoppers showed no alteration in terms of taste, aroma or colour.